A Wintergreen in GTA Vice City Stories. The Wintergreen is a motorcycle in Grand Theft Auto: Vice City Stories. Similar to a Harley-Davidson Electra Glide, the Wintergreen is essentially a touring motorcycle distinguishable by heavy duty construction, a fairing, and panniers/boxes mounted on its sides and top towards the rear. 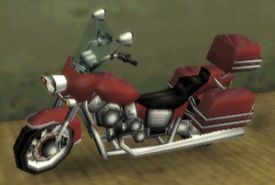 The bike sports a minor cosmetic difference between the PlayStation Portable and PlayStation 2 versions of the game, featuring a taller windshield in the PS2 version than in the PSP version. The Wintergreen boasts generally good performance credentials, with an average speed and good acceleration. Similar in construction to the Freeway, however, the Wintergreen requires moderate use of the brakes to handle sharp corners. Its speed is not also inferior to the Freeway's. The Wintergreen is wanted by the Civil Asset Forfeiture Impound, and a "super" version appears in "The Bum Deal". A police variant of the Wintergreen, known as the VCPD Wintergreen, is used by motor officers of the Vice City Police Department for regular patrols and pursuit of the player. Unlike the Wintergreen, the VCPD Wintergreen is outfitted with several additional equipment. The VCPD Wintergreen is a police modified version of the Wintergreen used by the Vice City Police Department all around Vice City. Usually ridden by civilians around Downtown, Vice City. Behind the Malibu Club in Vice Point, Vice City. By a side-walk next to a cafe in Washington Beach, Vice City. This page was last modified on 18 August 2012, at 23:19.